Retired France and Arsenal star Thierry Henry said on Monday that he was quitting as a football analyst with British broadcaster Sky Sports to focus on a coaching career. 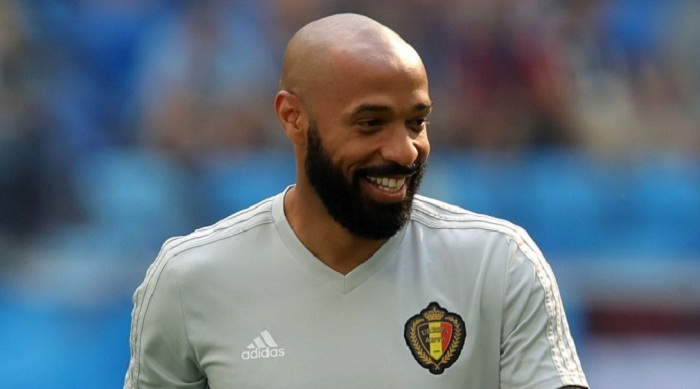 Henry, who had worked for Sky since 2015, has also been an assistant to Belgium manager Roberto Martinez since 2016 and helped lead the team to third place at the World Cup. "Over the last four years I have had some extremely rewarding coaching experiences in football," Henry wrote on Instagram and Twitter. "These experiences have only made me more determined to fulfil my long-term ambition to become a football manager. "I have decided that I must leave Sky Sports to enable me to spend more time on the pitch and concentrate on my journey to achieving that goal." Henry gained his coaching licence working with Arsenal's youth team but opted in 2016 to focus on his work for Sky rather than take a job at the club. France's all-time leading goalscorer, was a member of the squads that won the 1998 World Cup on home soil and Euro 2000 alongside Didier Deschamps, who on Sunday was crowned world champion for a second time as manager of France.